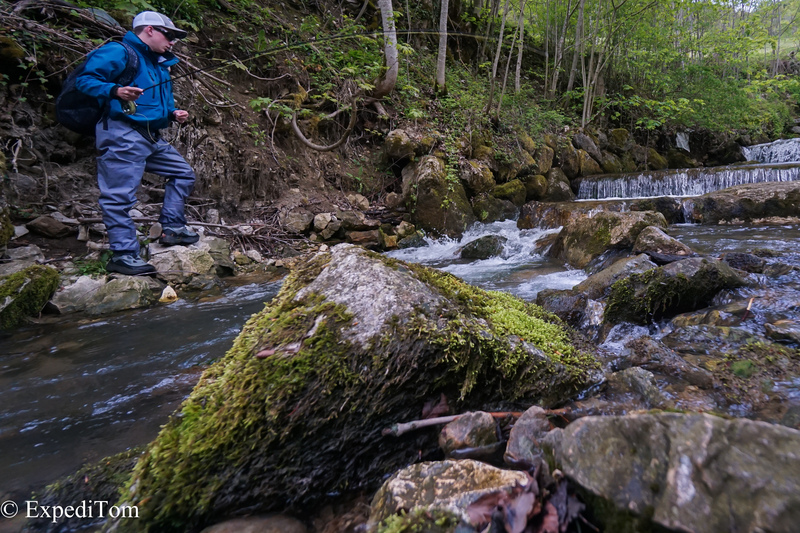 Recently my mate Robin Melliger and I undertook a fly fishing trip in the Jura mountains and were highly rewarded. Read on! The forecast for Friday was pretty bad. They predicted several thunderstorms throughout Switzerland. Still, Robin and I decided to go on our long-planned fishing trip. 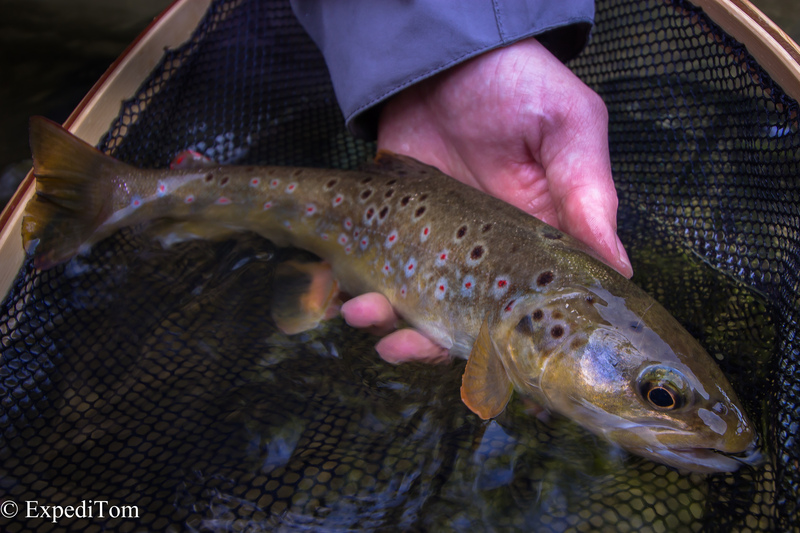 I took him to the Long pool, which has already produced trout on various occasions. 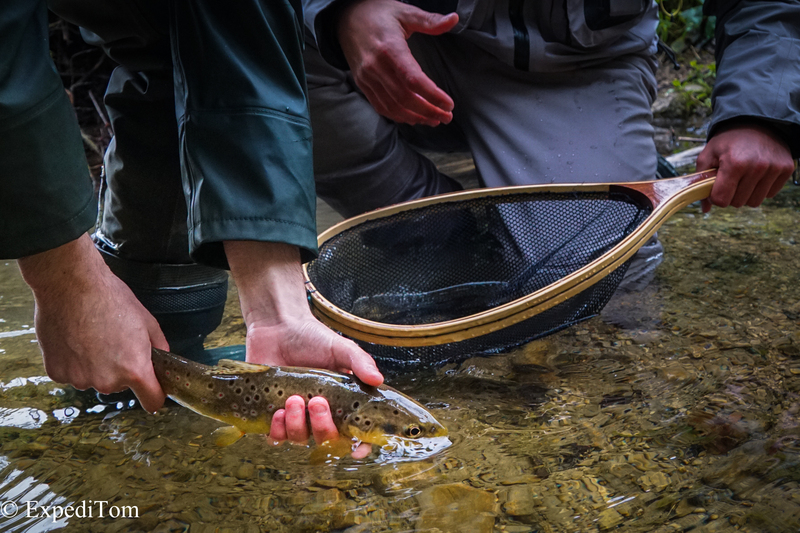 Only recently I ventured there with two beginners, we were able to catch a gorgeous fish, which we carefully released to its habitat because of its importance for the gen pool. Robin casts pretty good for a beginner and achieved some promising drifts through the long pool. At one point, he asked me how he can see a bite when all of a sudden the indicator wool sank. “THAT’S A BITE!”, I screamed. Seconds later, the first trout of the day escaped and we both laughed. Unluckily Robin’s fly got stuck in the trees so that we put his rod aside and he continued fishing with my rod. Few casts later my rod was tied to a tree in front of us as well. We went to the middle part of the pool to untangle our flies. Then, I tried in the very same pool just few meter away from our place. Given the closeness, I rather fished with a French nymphing style without the indicator even touching the water surface. The heavy jig nymph drifted from the head of the pool to a submersed boulder. Within seconds the trout bit and an interesting fight began. 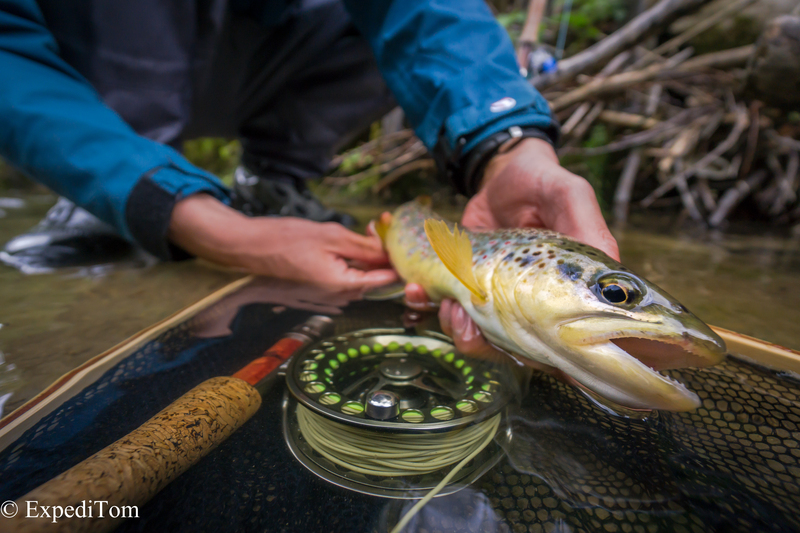 Given that we were standing in the middle of branches and very close to the fish, it was a miracle that I successfully landed the large trout. As soon as I had a closer look at the fish, I instantly remembered him. His pattern with the noticeable injury on its back is unmistakable. I had caught him already once on a trip with two beginners. Compare the following two images and you will swiftly recognize that it’s the very same trout! This image was shot 3 weeks ago at the Long pool. Do you see the similarities? After this great start of the day, we decided to venture into a small gorge with lots of pools. Even though Robing had had contact with a fish, my goal seeing him landing a fish was not yet fulfilled. 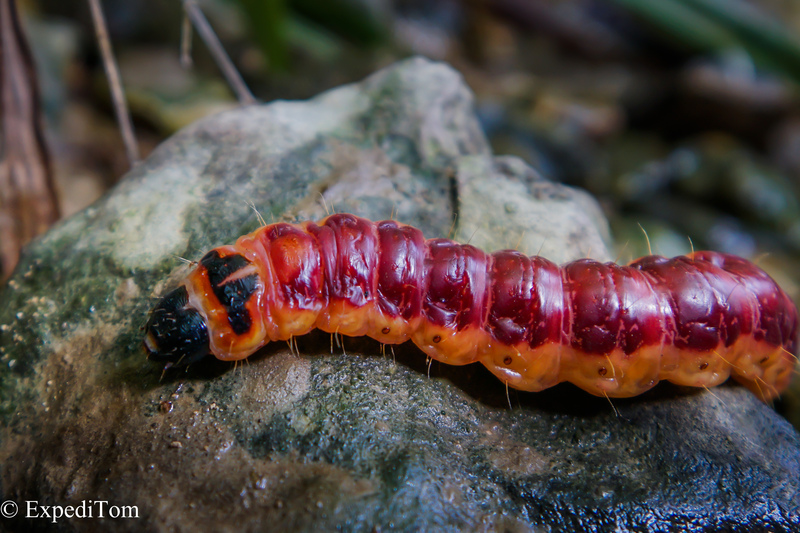 It was when I took some photographs of a caterpillar when Robin yelled that he had landed a small one. 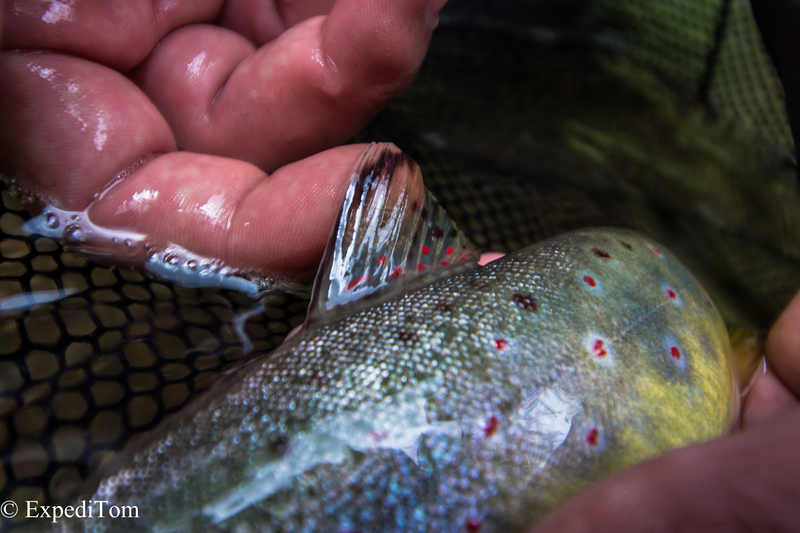 Close-up of a beautiful translucent dorsal fin of a brown trout. From this point onwards, we fished alternatingly each pool and caught several more fish. 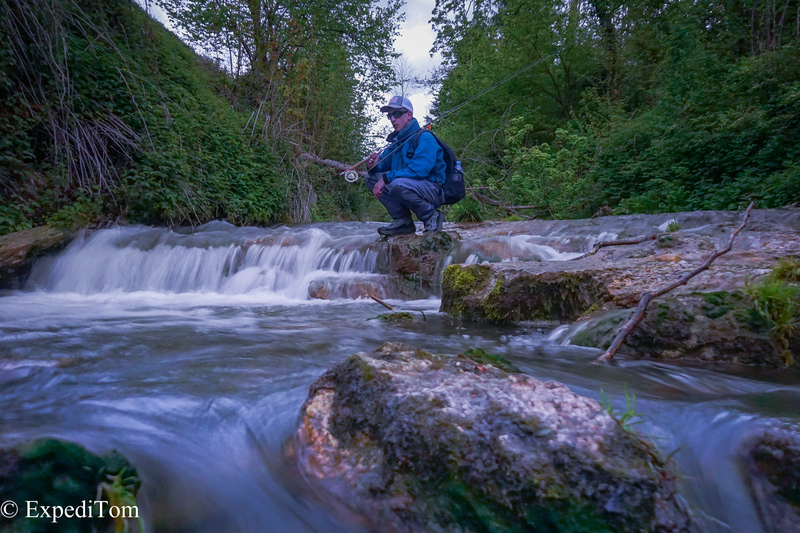 At one particular pool, Robin even caught an extremely large trout for this tiny creek and it gave a hell of a fight. The fish was Robin’s personal best on the fly. Only seconds later, a heavy downpour started with hail and thunder. Hastily, we left the gorge because the water had turned chocolate within minutes. Therefore, we went for lunch. Robin Melliger’s new personal best for a trout on the fly – well done buddy! While eating, I checked the weather and realised that all rivers nearby must have plenty of water at the moment. Thus, we went back to the same creek. An hour had passed and a look at the lower parts of the river looked promising. To our surprise, the river was not murky at all but only slightly coloured. We fished for a few more hours and I even managed to catch a trout on a dry. At the same pool Robin hooked another fish on the nymph. This was the sign for us to call this adventurous fly fishing trip a day. 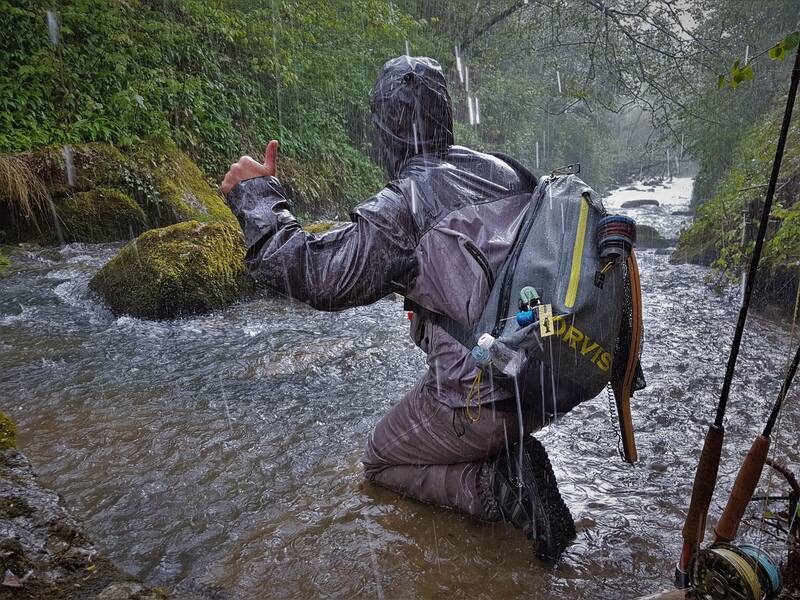 The fly fishing trip with Robin Melliger showed how superb experiences can be made although the weather forecast was horrible. However, I have to point out that the security has always the highest priority. There had been an emergency exit in the gorge at all time. What I found striking about the downpour was how different the water clarity is affected by rain. Whereas next to steep river banks a lot of debris is washed into the creek, the lower parts in the plains stayed clearer. Thank you Robin Melliger for this great day!